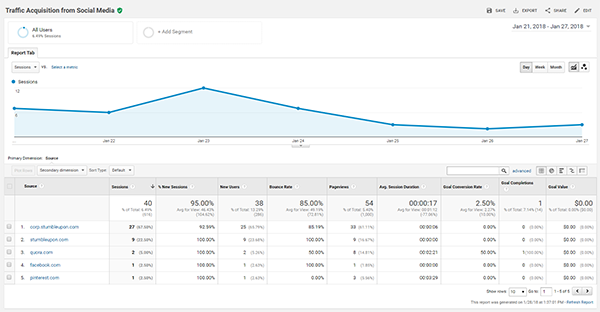 Custom Google Analytics reports can show you a number of things about your website or business that can help increase your overall ROI and website usability. Some of the biggest online marketers in the world have created custom Google Analytics reports and you can actually use them yourself… for free! 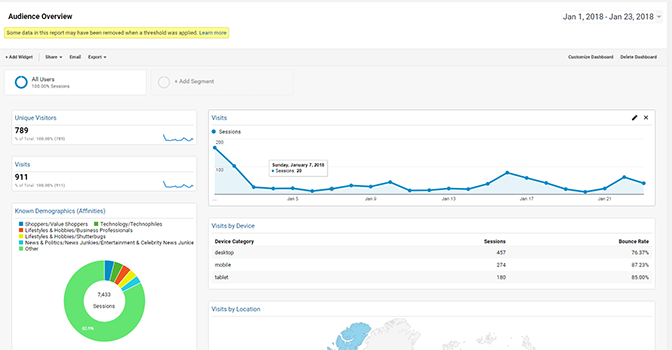 In the Google Analytics Solution Gallery, you can find thousands of custom Google Analytics reports and Dashboards that will help you see data you never knew you had before. Some of the biggest marketers share their reports here and you can import them right into your Analytics dashboard. Having a fast loading website is a huge factor with SEO and keeping visitors on your site. You can actually keep a close eye on your site’s performance with the site performance dashboard report. It’s a great dashboard to see load times by country, device, pages and even server response times. If you are wanting to save money on tools like New Relic and other server monitoring tools, you can install this free site performance report in Google Analytics. This dashboard will show you a top-level overview of your website visitors like where they are located, what device they are visiting from and how engaged they are. 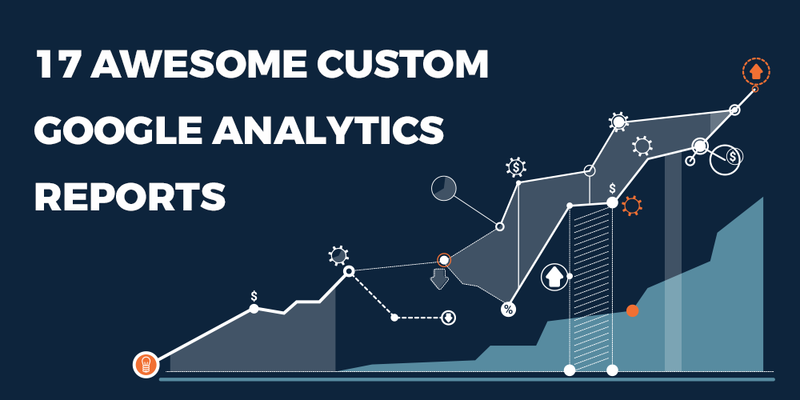 This custom Analytics report was created by Loves Data and has been used almost 30,000 times. The SEO Dashboard report by Kevin Pike has been used over 80,000 times and will show you top landing pages by completions, bounce rates and long tail keywords with conversion rates. 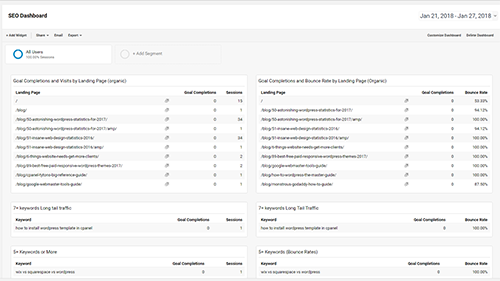 If you are generating SEO reports for your clients or you want to see the results of your SEO campaign, the SEO Dashboard is the perfect custom report. With this report, you can see how your best customers are getting to your site. 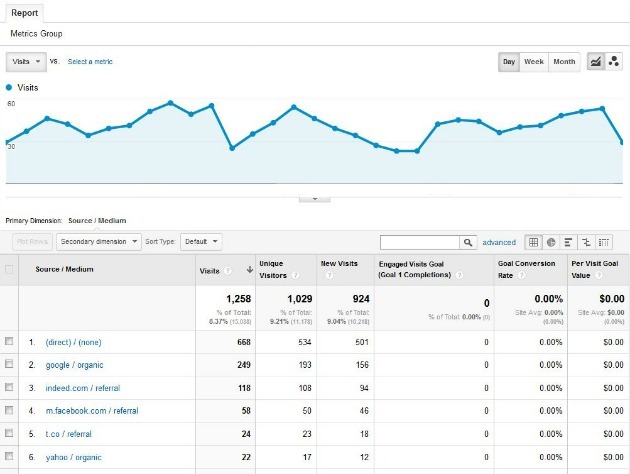 It shows the top visits and conversions by traffic source. If you have conversions set up on your website then this report is vital to figuring out your target traffic source and seeing where your biggest customers come from. Conversions are the most important part of your business. Conversions equal revenue which you want to track as much as possible. With the Goals and Channels report, you can see goal completions by channel, location, age and other great dimensions. The Goals and Channels dashboard report was created by Paul Fervoy and has almost a 5-star rating. With this report, you can schedule it to send weekly via email to your manager or clients. You can also do this with Ninja Reports as well but with more options. If you are new to Google Analytics then the New Google Analytics User Starter Bundle is a perfect report to start with. Its a bundle of must-have dashboards, segments and custom reports for any new Google Analytics user. View Acquisition efficiency, mobile metrics, referring pages and more. This Google Analytics Custom Report was created by the Google Analytics Team and is currently being used over 235,000 times. Traffic Acquisition from Social Media Analytics report is perfect for any Social Media Agencies or brands who focus on social media. It will show you traffic that comes from all types of social media, goals from social media and all sorts of great data about your social sources. This report was created by Vagellis Varfis from Vagelis Varfis at Nudge Digital. 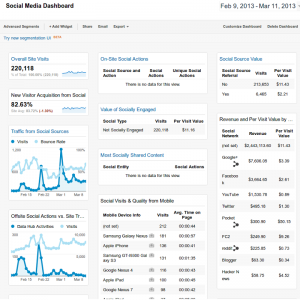 This report dashboard is a necessity for anyone doing digital advertising using Google Adwords. Created by Loves Data, this custom report has over 25,000 downloads and a 4-star rating. The custom report will show you the performance of your Google Adwords campaigns including, keywords, ad groups and other vital metrics from Google Adwords. Use this report to optimize your Adwords campaigns by viewing the highest converting ad groups, keywords and campaigns. If you run any sort of re-marketing campaigns for your business or your clients, then you should try this core remarketing list created by Dan Stone on the Google Analytics Team. This core set of 20 lists are based on user engagement and allows you to re-engage with your users differently based on frequency, recency and visit duration. Note: RLSA will automatically adjust membership duration to be a maximum of 180 days (vs. 540 days available on Display), so if you are using these lists for RLSA, the 360 and 540-day lists will be identical to the 180-day list when used in Search. This custom report by Rachael W on the Google Analytics team is an end to end report to see all of your user outcome metrics, behavior and acquisition, all in one simple report. It will combine paid search from all your paid search sources whether its Google Adwords, Facebook Ads, or any other paid traffic source. You can view impressions, visits, clicks, Cost, CTR, CPC, Revenue, RPC, Transactions and more. The Mobile Ecommerce Dashboard is a report created specifically for measuring mobile activity on your e-commerce website. Focusing on revenue from mobile, you can view a number of great metrics like top performance campaigns and mobile bounce rates. You can view which devices have the highest bounce rates so you can fix any device specific design issues. If you run an e-commerce website that gets any mobile traffic, you should really try this report out. The mobile app dashboard was created for people who have Google Analytics installed on their Mobile App. 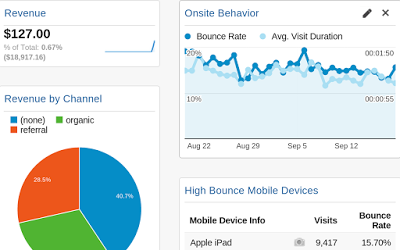 If you are not tracking analytics in your mobile app, then you should install it right now and use this dashboard. It focuses on visitor acquisition, engagement, and outcome perspectives for your mobile App. When you run SEO campaigns for clients, you must keep a close eye on the performance of the campaign. With the SEO Dashboard, you can see all the best-converting pages from your pages as well as long tail keyword traffic and break down of all your best keywords by visits, bounce rates and conversions. To keep a close eye on your SEO, try the SEO dashboard by Kevin Pike. When you run an e-commerce site, SEO is one of the most important metrics to look at because it’s one of the best ROIs for your money. 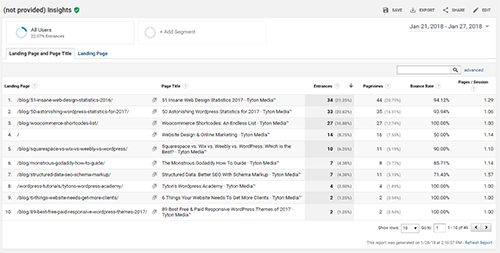 With the e-commerce dashboard by Nudge Media, you can see an in-depth analysis of your SEO efforts to see if your non-branded organic traffic generates higher revenue orders. The SEO Insights report will show you landing pages listed by most entrances, pageviews and bounce rates. View which if your landing pages are generating the best SEO return. Get an in-depth look at your pages/sessions and bounce rates for your most important landing pages. Social media reports are really important for growing your brand online. With the Social Media dashboard report, you can see how your social media profiles are performing. With this dashboard, you can view off-site activity, on-site activity, conversions from social media and revenuer as well. This report by Rachelle Maisner is a 4 tab report that shows you social media engagements on your website. You can see top shared content, conversions and socially engaged visitors. This entry was posted in Analytics Tools, Google Adwords, Google Analytics, Social Media Reports. Bookmark the permalink. Tyler Horvath is a Webpreneur, Founder of Ninja Reports and avid coffee drinker. Get the latest on automating your reports! Ninja Reports offers automated email reports for your favorite online apps like Google Analytics, Google Adwords, Facebook Ads, Salesforce and more.